The G. R. O. W. (God Renewing Orthodox Women) Ministry of our Diocese, continues to spiritually nourish and strengthen the lives of our young women. Since the establishment of this ministry, there has been a significant impact in the overall life of our Diocese. G. R. O. W. has offered mentorship to many of our young women in high school and college, as they are faced with various struggles and challenges unique to their own needs. Our Metropolitan, along with the GROW Ministry committee seek the participation of all of our women at the annual Diocesan One Day Young Women’s Conference on Saturday, April 9, 2016. 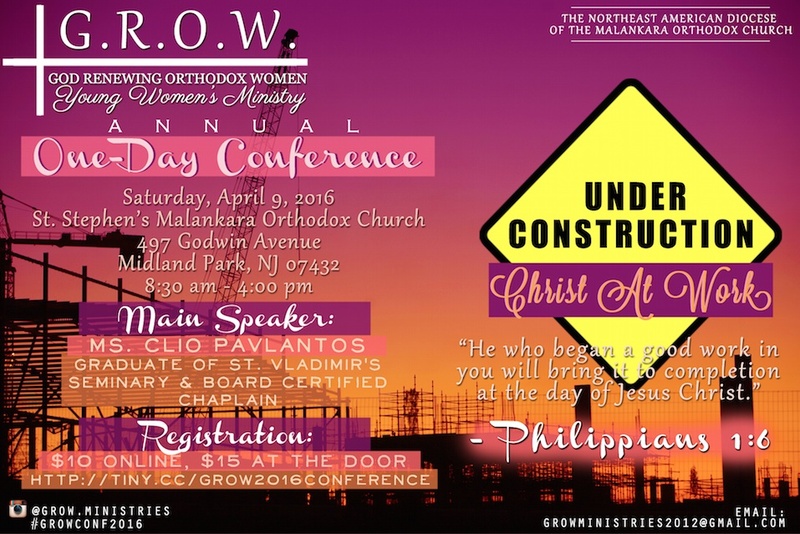 The GROW Conference will be held at St. Stephen’s Orthodox Church, located at 497 Godwin Avenue, Midland Park, NJ 07432, and begin at 8:30AM.